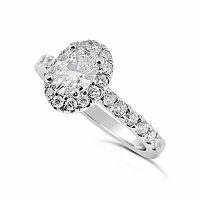 FSDR25/ 18ct White Gold 1ct Oval Diamond Halo Ring. Home » Engagement » Fancy Shape Diamond Rings » FSDR25/ 18ct White Gold 1ct Oval Diamond Halo Ring. Hand made 18ct White Gold Diamond Ring set with a GIA certified 1ct Dsi1 Oval centre diamond and matching Dvs round brilliant diamonds in the halo and shoulders.